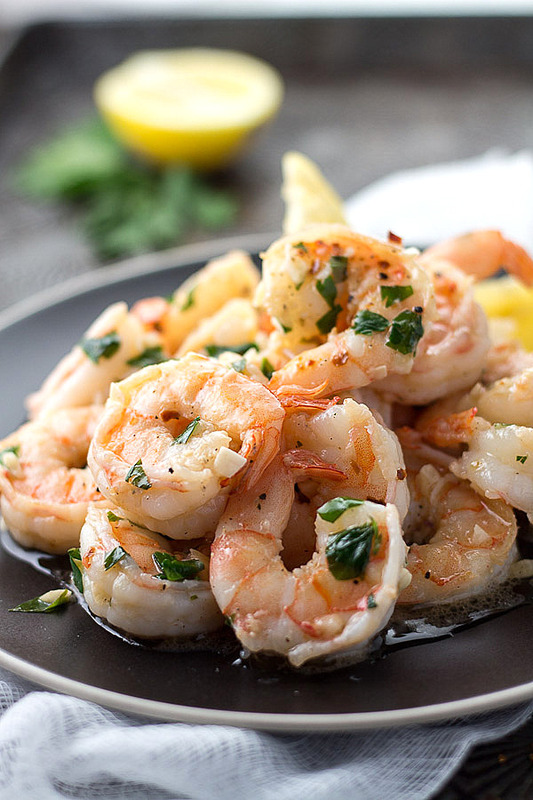 This low carb shrimp scampi features garlicky sautéed shrimp in a buttery white wine and lemon sauce is finished with parsley and Parmesan cheese. This delicious low carb Italian American dish cooks up in less than 15 minutes! June is always a busy month. The kids are home from school and many of us have graduations and weddings to attend, and summer vacations to plan. Soon, we’ll be planing our best dishes for summertime potlucks , picnics, barbecues, and family reunions. What makes all of these occasions memorable? The food! So, let’s make each dish the best we can by using the best quality ingredients we can find. For some of us that may mean using organic produce, non-GMO products or grass fed meats. Since I do a lot of baking, the ingredient that I pay the most attention to is a good quality butter. Butter makes it better! Lucky for me, it’s National Dairy Month and I received a cute little “Dairy Delight” package from Finlandia Cheese featuring some of their high quality imported butter and Swiss cheese. Their products arrived just in time to help me celebrate my son’s 8th birthday. We have a tradition in my house: not only do I make a scratch birthday cake on my children’s birthdays, but the birthday boy or girl gets to have whatever they want for dinner. This year, my son wanted shrimp! 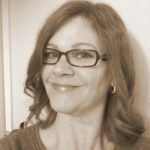 As a mom, I feel my priority is providing healthy and nutritious meals for my kids. Now, I’m not perfect and we consume our fair share of convenience items, but I’d like to think that at least our staples are healthy. Dairy is a staple for us and I don’t mind paying a little extra for a quality product we consume every day. 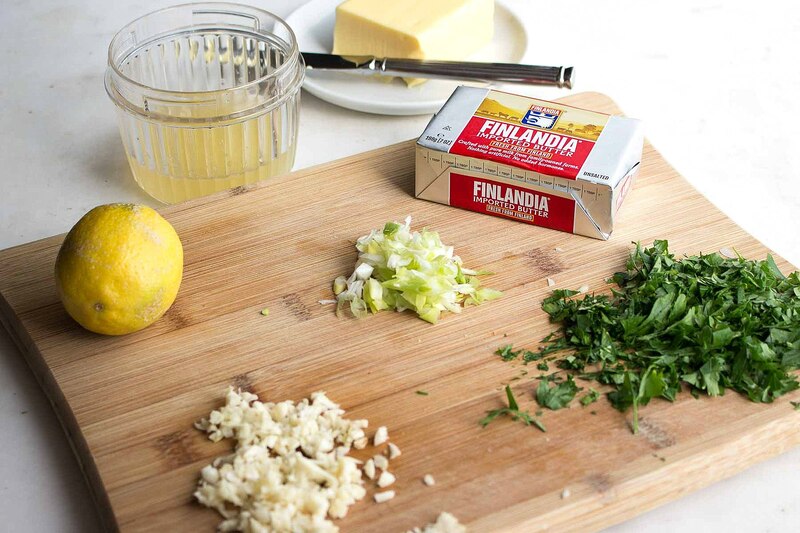 The folks at Finlandia Cheese, have been crafting high quality cheese and butter for over a hundred years. The milk for their products is produced by happy little cows raised on family owned farms in Finland – one of the greenest places on earth. The result is rich creamy butter that would delight any French pastry chef and some of the best Swiss cheese I have ever had — really! I have not always been a fan of Swiss cheese but the Finlandia Swiss cheese is mellow, rich, nutty and buttery tasting — a real treat. Their products are free from artificial ingredients or added hormones. Interested? Find a store selling Finlandia products near you. RECIPE: I don’t know about you, but for me, shrimp scampi is a dish that always delights. As a teen, I’d order it at my favorite Italian restaurant on special occasions and I still remember the intense smell of butter and garlic when my dinner arrived. Shrimp is one of my favorite foods so I’m tickled that my son also shares a love for shrimp. When he said he wanted shrimp for his birthday dinner, I knew exactly what I would make him! Shrimp scampi is usually served over pasta – NOT a low carb option, so I like to serve my garlicy shrimp with a nice side salad, over sauteed spiralized zucchini (I have this spiralizer), or with halved cherry tomatoes. All three ways are healthy and delicious. 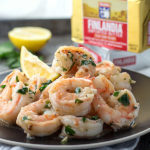 The ingredients for this low carb shrimp scampi recipe starts with imported Finlandia butter which is flavored with chopped garlic. Then, the shrimp goes in the pan with red pepper flakes, wine and lemon juice. 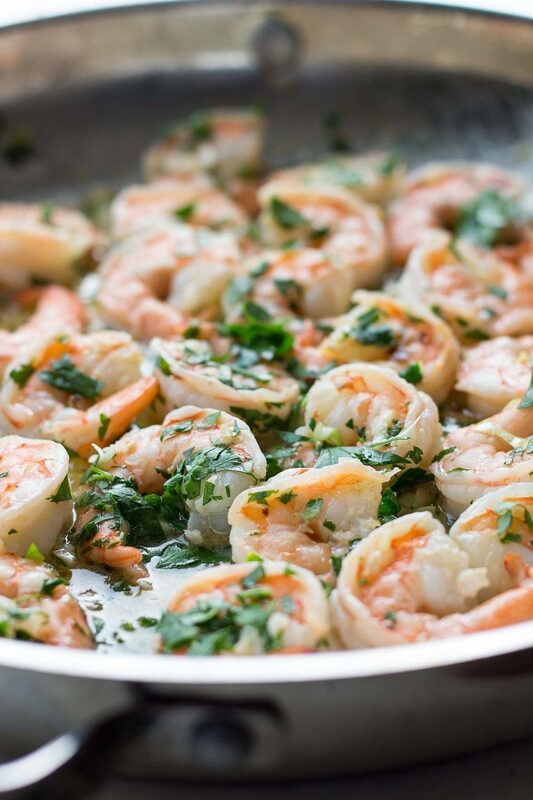 The shrimp is finished with parsley and green onion, then topped with Parmesan cheese. Our favorite way to enjoy this delicious shrimp scampi is with halved cherry tomatoes, but they can also be served in an avocado or with shiratake noodles (miracle noodles) for a perfect ketogenic meal. NOTE: To make this dish even faster, use precooked shrimp. Add it to the pan after the wine and lemon juice. Heat until warmed through. Then continue with the recipe. Do you like shrimp, too? Share your favorite shrimp dish in the comments and don’t forget to YUM the recipe. 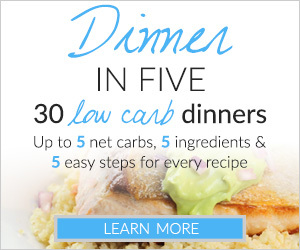 Each serving of this amazing low carb Shrimp Scampi is 4 net carbs. Garlicky sauteed shrimp in a buttery white wine and lemon sauce is finished with parsley and Parmesan cheese. This delicious low carb dish cooks up in less than 15 minutes! Prep: Peel and de-vein the shrimp. This can be done the day before, but because shrimp is highly perishable make sure to cook the shrimp by the next day! Juice the lemon. Chop the garlic and parsley and slice the scallions. Cook: Place a large saute pan (I used non-stick) over medium heat. When hot, add the butter, tilting the pan to melt the butter and coat the bottom of the pan. Add the garlic and saute until it begins to soften. Add the shrimp to the pan and cook until the bottom half of the shrimp turns pink. Turn each shrimp over with a pair of tongs and add the red pepper flakes. When the shrimp looks almost cooked through, add the lemon juice and then the wine. Cook for just a minute to let the liquid reduce. Turn off the heat and add the parsley and scallion, stirring to mix thoroughly. Salt and pepper to taste. Plate and top with Parmesan cheese if desired. Way too much lemon juice. That’s all you could taste. I thought better to myself but always try the recipe to the letter. Next time I’ll but it down to only a teaspoon or two. Also the shrimp really doesn’t have enough time to absorb the garlic flavor. Hi. You can try to add in the butter the garlic first, shrimps after and instead of wine you can as well use chicken broth or fish soup(?). Then chilli flakes, 2 tablespoons of lemon juice or depends what is your taste, ground black pepper and let it simmer for a while. I also add together with the butter a bit of olive oil. I’ll try next time to add some fresh mint to see what will be the taste. Hi Kim, thanks so much for the recipe. I did make a couple changes: I omitted the scallions, and when the shrimp were cooked I plated them and put the sauce back on high heat to reduce for about 2 minutes. I served the scampi over sautéed tomatoes and spaghetti squash. We prefer a more buttery scampi sauce, so I think next time I’ll only use 2 T each lemon juice and wine, and add a touch more butter. It was delicious, though, and husband-approved. Thanks again! Can I substitute shallots for the green onion? Hubby does not like them. Thanks. 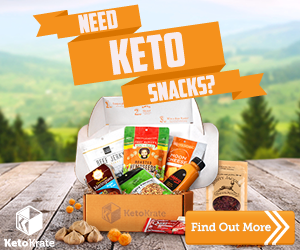 My husband and I are following a keto lifestyle right now. I found this recipe because we are seafood lovers!! 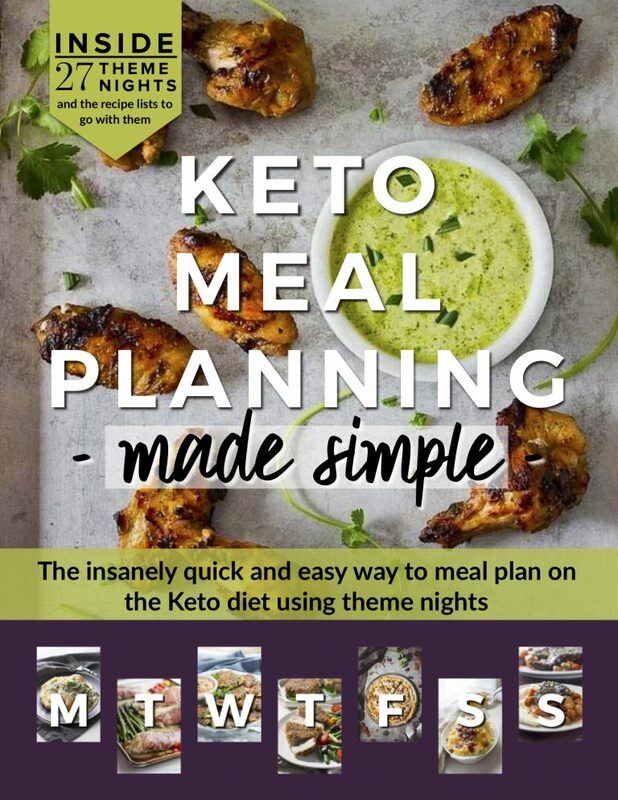 His initial reaction: “This is amazing, even as a non-keto meal! !” That means a lot because some things are great “for keto”, but you’d never eat them otherwise haha. By the end of the meal, he had already put in a request to have it again the next week!! Thanks for a great recipe!! What do I do with the cherry tomatoes? Just slice and throw the shrimp on them as is? Delcious recipe and fast! My husband was crazy for this! Where do you get 4 carbs/serving? I get that TOTAL based on the ingredients listed. Hi jg. I use the MasterCook recipe and cookbook program and I enter each ingredient by weight and it calculates the nutritional information for me. Shrimp has a small amount of carbs and onions and garlic contain a fair amount of sugar. Butter, too, has some carbs. The parsley is negligible. The net carbs is 4 per person without the cherry tomatoes and 7 net carbs with the tomatoes. I made this and had it over zucchini and squash noodles, very good. Thank you! I love shrimp scampi! All that garlic and butter! Sooooo Yummy! The shrimp scampi was delicious. I will be making this again very soon! Can this be made without the wine and if so, would you use something else?